Daffodils are synonymous with Easter. In England they are associated with Lent and occasionally referred to as Lenten lilies. Legend has it that the first daffodil bloomed on the night of The Last Supper in the Garden of Gethsemane to comfort Jesus in his hour of sorrow. Whether one is religious or not, there’s no question that daffodils symbolise rebirth, herald the arrival of spring and generally spread joy and hope wherever they grow. Hence I plant hundreds of them each autumn, yet always wish I had planted more. 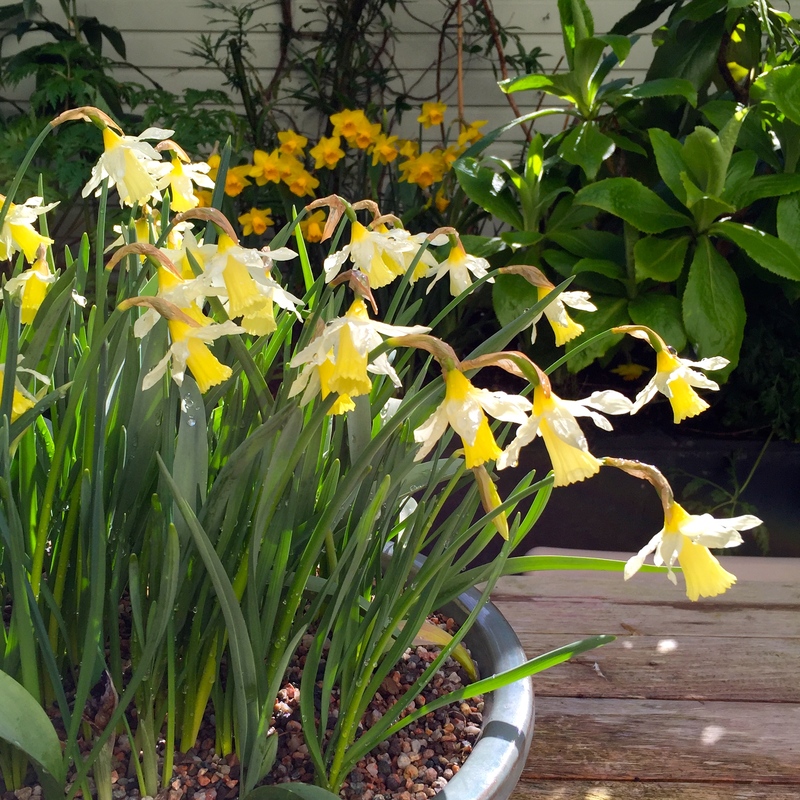 Giving me enormous pleasure in my garden right now is a diminutive daffodil named N. ‘Elka’. She bears pearly white petals surrounding a lemon yellow trumpet on stems about 12″ tall. The trumpets fade gently as each flower matures, eventually becoming the same shade as the petals. 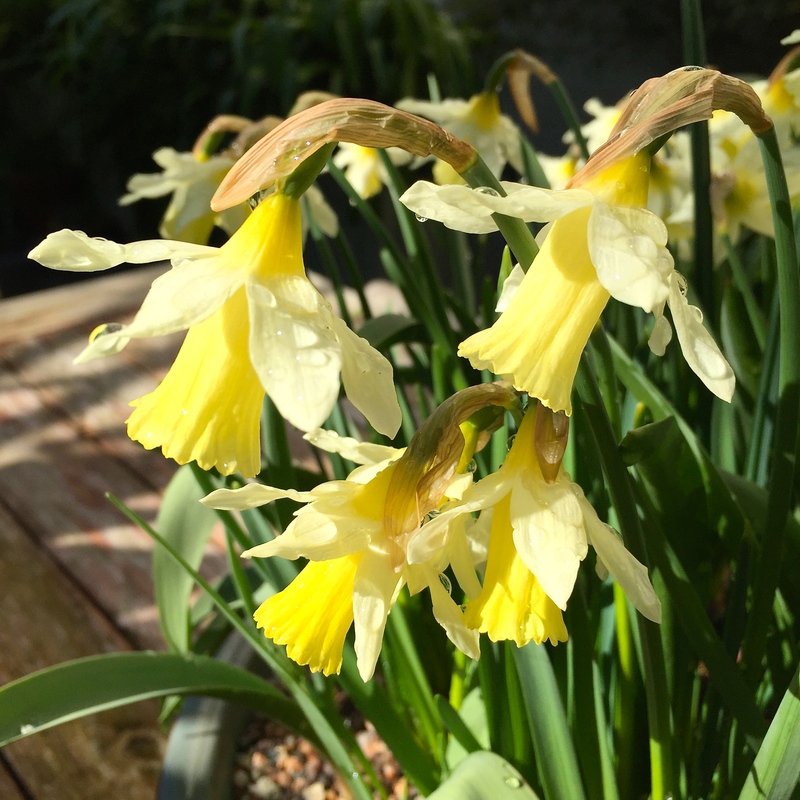 A new daffodil variety, N. ‘Elka’ was named by Cornishman Alec Gray (also responsible for the ubiquitous N. ‘Tête à Tête’) after two lady daffodil growers called Elizabeth and Kate. They must be very proud of their namesake. N. ‘Elka’ quickly earned an Award of Garden Merit from the Royal Horticultural Society thanks to her hardiness, early flowering and weather resistance. Such low growing varieties are best suited to sinks, pots or the front of borders, so this year I’ve planted N. ‘Elka’ in a shallow bowl on our garden table to follow the deep purple blooms of Iris histrioides ‘George’ AGM, and keep me smiling until Tulip batalinii ‘Bronze Charm’ starts producing its luminous apricot flowers in a couple of weeks’ time. 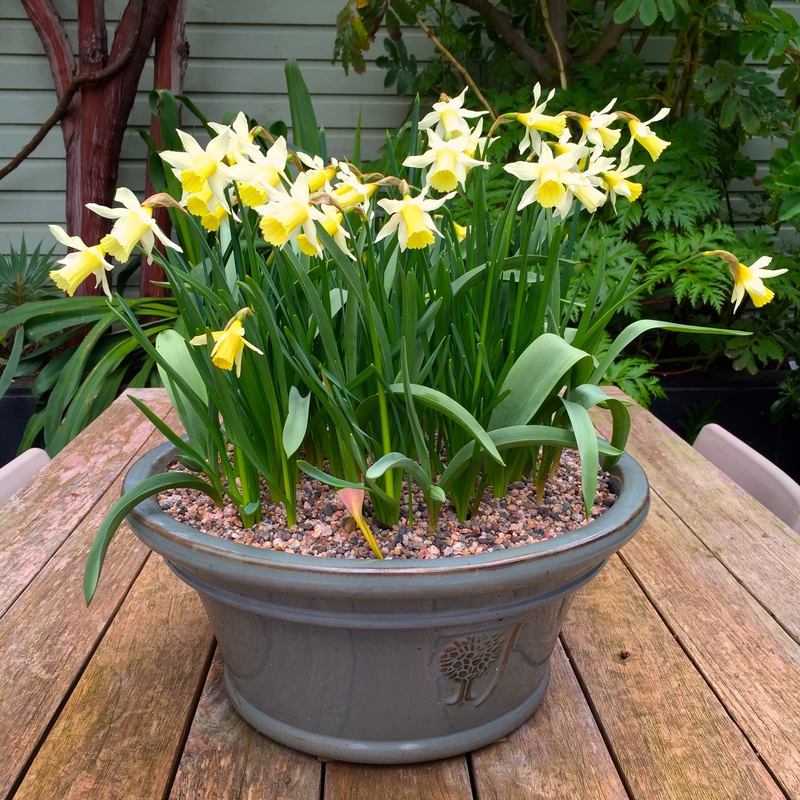 All three bulbs are hardy, charming and perfect for pot culture, flowering in close succession. Put them on your list for ordering in late summer. Avon Bulbs is a one-stop-shop for this cheery little trio. Wishing You and Yours a Very Happy Easter. TFG. I also love Daffodils for their cheeriness and also they remind me of my former home of many years, Cornwall. Love your, very regal looking , elegant planter ! Happy Easter to you and HIM indoors too. Thank you Elisabeth. We are off to Cornwall soon, although not expecting very cheery weather sadly! The “Elkas” look fabulous with the double colour, white petals and bright yellow trumpet. They will definitely be on my autumn bulb list. Love the droplets of rain on the petals and the sunbeams you captured in the flowers . Have a good trip to an time in Cornwall, Paul. Oh good! Enjoy it Paul. It is cold and rainy here, but the rain is good for the garden at least. Happy you like the look of Elka. I am growing Elka for the first time this year and what a little gem it is. Reblogged this on By Nature: notes from a besotted gardener. No worries! I do these things all the time. I was quite flattered to be honest 🤓 I am sure you must be able to delete the whole post if you want to? It’s like the blind leading the blind! I have been seeing Daffodils all over the tree beds in my neighborhood, and really feel that spring is here! You can never have too many daffodils! Enjoy. That’s a lovely tidbit about the Garden of Gethsamane. I find that whether one is “religious” or not, foundational cultural stories hold much symbology. Thanks for sharing the photos. As always Jan, you are quite right. I do not follow any religion but am interested in them all and the traditions they’ve introduced to us. Ubiquitous or not, ‘Tete-a-tete’ still is one of my favourites, but ‘Elka’ looks lovely, too. How do you feel about double flowered varieties? Hope you haven’t been blown off course by last night’s storm! Enjoy Cornwall and wishing you and your family a lovely Easter! Thanks Stefanie. We weathered the storm thank you. It all happened in the middle of the night so we missed most of the fun! I have mixed views on double daffs. Some I like, some I’m less keen on. I struggle with the very congested ones. Provided they are more waterlily than carnation I am happy to give them the benefit of the doubt. Like the ‘waterlily vs. carnation’ image. I’m no fan of doubles myself (as you probably will have guessed) but as always there are exceptions to the rule. And anyway – if it is grey and wet and bleak outside, any cheerful bloom is welcome! Lovely. I’m growing ‘Elka’ myself for the first time this year and will definitely buy some more next autumn. I’m glad you did some research into it because I’ve been too idle to do so… I’m a big fan of Tulip ‘Bronze Charm’ too, it’s a little belter!